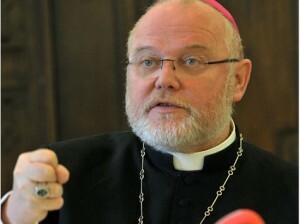 In short, Cardinal Marx proposed that the German Catholic Church would schism if the Synod on the Family did not yield the results they were wanting. The German Catholic Church is in favor of giving Holy Communion to the divorced, remarried and actively homosexual. Either the Holy Spirit has intervened and changed Cardinal Marx’s heart or he knows what the outcome of the Synod is going to be. Either Cardinal Marx is no longer in favor of administering the Holy Eucharist to adulterers and sodomites or he knows the Synod is going to lax the rules. My bet is the latter, as it is highly unlikely, knowing what we have seen come from the Synod thus far that Cardinal Marx is suddenly having a conversion. I’m not saying it’s impossible, only unlikely. I see that Option Two is much more likely to happen, simply because those who want to administer Holy Communion to adulterers and actively homosexual, will be able to through a liberal reading of the documents. Meanwhile, those who will actively refuse this reading will accuse the Synod of intentionally allowing this evil to occur. Thus what we will see is those who adhere to the “traditional view” (read: Catholic) will be accused of going the way of the SSPX and causing schism, when the reality simply is that Rome has condoned the practice by not condemning it, all for appearing to be “pastoral”. Cardinal Marx, by his words today, has set the stage to display that those who do not adhere to what the Synod decides are breaking away from the Church. He is correct only if the Synod upholds Church teaching by denying Holy Communion to those in the state of mortal sin. However, if the Synod decides something contrary to this effect, then he is wrong and the validity of the Synod is left in question. Let us pray that he had a legitimate conversion to the Truth, and not the other, more likely possibility. Pingback: “Once the meeting is over, power will rest entirely in the hands of the Pope.” | What's Up With the Synod?